We stayed in the Little Mermaid room and it was super cute! Everything was very clean and fresh. The room and the air conditioner were very quiet. We had a corner room 7737 and never heard our neighbors. The food court had a great variety and was reasonably priced. I would highly suggest this resort! Check in was quick enough with a cast member guiding people to the correct check in lines. All in all, it took about 15 minutes to complete check in and we were able to go to our room by 1pm. We stayed in a cars family suite in bldg 2 with our teens and one of their friends. I was pleasantly surprised that the kids all loved the themed rooms and the grounds despite their ages. The room was very clean and was well designed with 2 full baths, a small kitchenette and bedding that accommodated 3 adults and 3 teens. At ck in we were given the choice to opt out of daily cleaning in exchange for a $20 gift card. Since we could still request towels and have garbage collected, we chose the gift card for our 3 day stay. The cars pool stayed open until 10pm while the main pool was open until midnight. Bldg 2 was a 5 min walk to the buses and to the onsite restaurant. Initially we had an issue with our magic bands not opening the room door but luckily one of the kid's bands was working. After going for a swim we went to the front desk where a manager reprogrammed them and even came back to the room with us to make sure they worked. It was kind gestures like these throughout our stay that helped make any minor issues not a big deal. We all enjoyed our stay and I would definitely recommend cars bldg 2 and Art of Animation again! Small room, but extremely clean! No complaints! The "housekeeping service" went above and beyond. Love staying at Art of Animation because of the family suites. We like the sleeping space and the two bathrooms. We had a nice, comfortable room with a lovely view of the lake. My 5 year old loved the theming of the room and really, the entire resort! Almost everyone on staff at the resort was super friendly and helpful. Art of Animation has a great food court with food that suits all sorts of palates. They even have a heated pool onsite (Mermaid pool). We really only had one problem the entire time and that was a blanket shortage. It took several calls, one trip to the main hall, and one note but we did finally get it solved. Other than that, our stay was incredible! This hotel is a value resort equivalent. Noisy, pull out couch very uncomfortable in the suites. Not worth the price. We had a great experience. Place was clean and fairly comfortable. We had a short walk to the pool and quick service restaurant. We stayed in the cars building three. We walked around frequently. It was a great relaxing experience. my mermaid art of animation hotel room was little far to lobby (you can walk from lobby to hotel room )and food court, mermaid building was number 8 try to find lower number like 4 or 5 which would be very close to free bus stop and hotel lobby and food court . 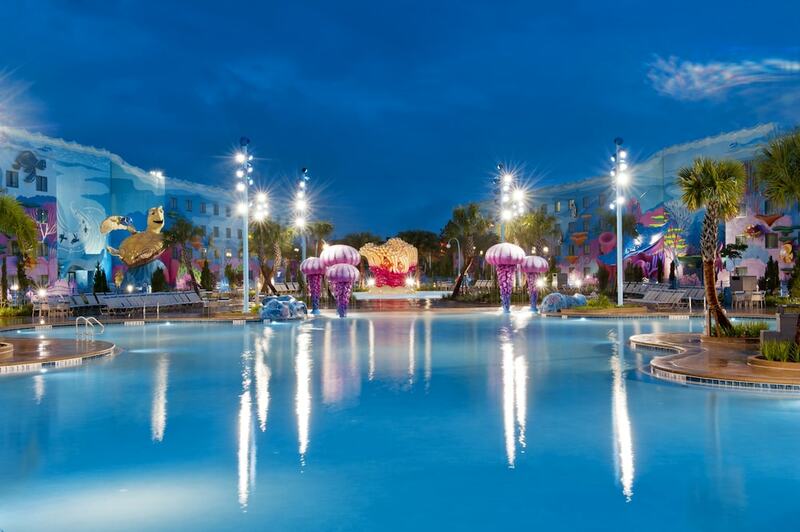 Located in Bay Lake, Disney's Art of Animation Resort is within a 10-minute drive of popular attractions such as Disney's Boardwalk and Disney's Blizzard Beach Water Park. This 1984-room, 3-star resort welcomes guests with 3 outdoor pools, a restaurant, and free in-room WiFi. Enjoy a bite to eat at Landscape of Flavors, the resort's onsite restaurant. For your convenience, a cooked-to-order breakfast is served each morning for a fee. A flat-screen TV comes with satellite channels, and guests can stay connected with free WiFi. Other standard amenities include a hair dryer, a safe, and a phone. Guests of Disney's Art of Animation Resort enjoy features like 3 outdoor pools, free WiFi in public areas, and a business center. If you drive, self parking is USD $13.00 per night, or you can take advantage of the free airport shuttle (available 24 hours). Front-desk staff can answer questions 24/7, and assist with tours or tickets, luggage storage, and dry cleaning/laundry. Other amenities at this family-friendly resort include an arcade/game room, express check-in, and express check-out. Landscape of Flavors - Restaurant specializing in international cuisine and serving breakfast, lunch, and dinner. Kid's menu available. The resort has 3 outdoor swimming pools. The front desk is open 24 hours a day, and checking in and out are easy with express services. For convenient arrivals and departures, you can take advantage of the free airport shuttle (available 24 hours). Driving? This property offers parking (fees apply). 24-hour airport transportation is available on request. Fees may apply. Guests can contact the property in advance for details. Disney's Magical Express service provides roundtrip motorcoach transportation and luggage delivery to and from Orlando International Airport and select Walt Disney World Resort hotels. Guests who wish to utilize Disney’s Disney's Magical Express must make a reservation in advance through the Disney's Magical Express website. Pet Policy: Reservations in the Cars Family Suites and The Little Mermaid Standard Room may include up to 2 dogs per room (surcharge). Pets are not permitted in any other room category. Guests must request a dog-friendly room at time of booking, or by contacting the property in advance of arrival. Guests traveling with their dogs must register them with the front desk and adhere to the pet policies they receive upon registration. Contact information is provided on the booking confirmation email. Guests staying at this Walt Disney World Resort hotel can enjoy the following benefits during their stay: First access to reserve a limited number of Disney FastPass+ attractions and shows, up to 60 days before they arrive (theme park tickets required); extended theme park hours with Extra Magic Hours at 1 of the Disney theme park each day (theme park tickets required); complimentary resort transportation via motor coaches, ferries, and monorail, providing convenient ways to explore all the theme parks at Walt Disney World Resort; complimentary parking at Walt Disney World Resort hotels and theme parks; complimentary MagicBands to access Disney theme parks (theme park tickets required), unlock guestrooms, check in at FastPass+ entrances for previously selected attractions and entertainment, and make payments at shops and restaurants; complimentary roundtrip airport service between Orlando International Airport and select Resort Hotels via motor coach with Disney’s Magical Express, including luggage delivery straight to guestrooms; resort Hotel entertainment, including themed pools with slides, outdoor Disney movie screenings, and Disney Character Dining experiences. Valid Theme Park admission tickets and online registration required for Disney FastPass+ attractions and entertainment (the number of selections guests can can make and available arrival windows are limited). To book airport transportation, guests must contact the property in advance of arrival; contact information is provided on the booking confirmation email. Offer subject to availability. Restrictions and blackout dates may apply.